Extropia announced this week that it has sold out all available plots on its “Extropia Core” hub, but that it will be opening a second sim in early February, and is taking reservations for land there now. Retail space in the mall is still available. In the meantime, the board of directors at Extropia is keeping busy. Upcoming events include a party at Al Andalus (another microgovernmental project in Second Life that opened in September) to commemorate the opening of Extropia’s “embassy” there, and a December 22 Solstice celebration. Nodes: Citizens of each Extropian sim elect a Node. 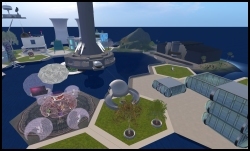 The Node mediates all disputes involving citizens of their sim, and organizes events and activities to build community among sim residents. Elections are held the first weekend of each calendar quarter (January, April, July, October). Director, Citizen Relations: The Director, Citizen Relations is a voting member of the Board of Directors of Extropia, and is responsible to the Chairperson for the lives, liberty and happiness of all Extropian citizens. The DCR shall plan, organize and execute regular nationwide events, supervise the Nodes, and act as an appellate judge for disputes the Nodes are unable to resolve. Elections are held the first weekend of each calendar quarter (January, April, July, October). We are a community of Second Life residents sharing a common desire to build a positive, beautiful, empowering future for all. Unlike other land options, Extropia is a place where residents are encouraged to work and play together, and to govern their own affairs to the greatest extent possible. As a result, immigrants to Extropia are required to forge ties with the community before being eligible to purchase land and become Extropian citizens. In return for not permitting resale of land to third parties, the Government of Extropia guarantees full refund of your deposit (less arrears), should you ever desire to leave the community, insuring you from your risk of investment loss. The core build is attractive, the project is uniquely positioned, and the designers seem to have a good sense for the appropriately small role of microgovernment in Extropia citizens’ lives. It will be interesting to see where this goes. I kept seeing all these “Extropia” and “Extropia Core” identifiers floating around and didn’t know what it was. Thanks. ive privatetly used a derivative term as a mocking joke for a few years now to suggest that those ‘extrapolarians” that their children are now the horrid meta bloggerati of the SL present. Benjamin – Thank you for your kindness and generosity! We’re always delighted to welcome visitors, and the party on the 22nd will be our chance to showcase our Citizens and their creations, from 9am to 9 pm SLT. We’ll also be awarding a charitable donation that day to Second Life Africa, and honoring winners in our FreeRice Contest to encourage literacy, combat hunger, and showcase the activities of our friends at Second Life Africa in bridging the digital divide. We hope your readers will join us there, and on our blog forums, and engage with us in our experiment in community and self-governance! Sophrosyne – VB covers all the government sims, so you’re on my radar now. I will say, personally, that I loved the look of the build when I visited to take screenshots and think you’ve got an interesting angle on governance. I’ve already admitted I’m one of those awful singularity-Stephenson-AI-brain- uploading types, so it won’t surprise regular readers much that I like the positive future theme. Good luck! A very interesting idea, but, unfortunately, let down by the idea of electing judges (or rather, “nodes”): elected judges are incompatible with the judicial independence necessary to uphold the rule of law. It is also somewhat unclear why “nodes” should both act as judges and event organisers when the skill-set required for each is very different (unless they meant “mediate” literally, and the “nodes” are just ADR providers; but then, where is the real judiciary?). I’d be very interested to see how their legal system works, especially their legal procedure. It would be very interesting to see how age old legal procedural questions, such as where the burden and standard of proof lies, how parties start proceedings, what happens if a party argues a case different to that in any written notice required to start proceedings, what time limits that there should be, how applications to adjourn cases on the day of trial are addressed and so forth are answered in a virtual environment. I should be particularly interested to see whether the judicial proceedings are public, and, if they are, go along and watch a few cases. @ Ashcroft: You raise some very interesting questions, and I hope you will keep an eye on us as we grow. That said, we’re a community, not a state, and a community run along generally small-l libertarian lines. The Board is undertaking to provide a few services in support of an emergent social order: some events, some public spaces, the physical infrastructure of the SIMs, and, as you’ve seen, a framework for dispute resolution. In the context of Second Life, I personally (speaking as a Citizen and Board member, but *far* from ex cathedra!) don’t see a role for SL resident-created law or government as a nation-state would conceive them, outside a roleplaying context (which could be really valuable, and possibly even fun for some, but not our focus). Bear in mind that currently we have 13 citizens, with a plan to grow to approximately 150 within a year, beyond which point we’re not even speculating. That keeps us to Dunbar’s number, roughly, and with the community protections in place that Benjamin described, we hope to do through cultural norms what mass societies are forced to do through law. That in part is our experiment – to see if social networking tools can replace the tools of the nation-state for security, dispute resolution and development. If we find ourselves resorting to law and statecraft, I’ll consider our experiment a failure. On the other hand, should we even need to use our dispute resolution mechanism, and should it be effective and useful, we’ll consider making it more widely available. We recognize that should we grow much bigger than our first-year plans, we’ll need to revisit our institutions. Hopefully, we can turn to you, and Virtually Blind’s other readers, as we get there, for advice – and better still, for direct participation as Citizens! Siohrosyne: thank you for a most interesting reply :-) It should indeed be fascinating to see your experiment grow – I shall have to come and visit you one day. You are right, of course, in that a truly minute community both does not need and cannot sensibly cope with the formal institutions of state required for a larger community. Size is the key: provided that everbody in the community knows each other personally, formal institutions are both unnecessary and probably unworkable. As soon as the community (including outsiders who partly participate in community activities: think of a micronation with foreign nationals who work there regularly) grows large enough that people no longer know everybody else personally, then the formal institutions of state become both possible and necessary. The medium of interaction between people is irrelevant: the virtuality of the world does not displace the basic principles of social organisation. I do not agree that there is no place for formal government in SecondLife: there are more than enough people by far for such things to be both possible and necessary, and there are plenty of conflicts that are sufficiently specific to virtual worlds (and even specific communities within virtual worlds) to make such mechanisms worthwhile, albeit perhaps not for an organisation as small as one with thirteen citizens. I also disagree that social networking tools can displace the apparatus of nation states for dispute resolution: nothing other than the rule of law will suffice for enforceable dispute resolution, and unenforceable dispute resolution is nearly worthless. The rule of law requires formal institutions and formal rules to exist, and has as prerequisites such things as the separation of the powers and judicial independence. Networking is a very different function to the enforcement of rules and the upholding of the rule of law: networking is about collaborative functions where people agree and/or are not in conflict: human-intelligence dispute resolution powers are needed to resolve all but the most basic of human conflicts, and human-intelligence dispute resolution powers can only work effectively in a framework including the rule of law for any community that is too big for all participants to know each other personally. I Just had a few of the nice extropians playing in the New C3 Victory’s Bridge Playset:) over Great Escapes Sim… So far so fun. anyhow.. Ill extrapolate for the new extropians…and hope the future in networked 3d vr worlds of these Extropians is brighter than the short party bubble of those so named in 1996. The sooner they leave La La Linden land..maybe the better… but lets face it, every other metaworlds app in developement today is missing the 3 main elements that made SL catch on…. Ashcroft, I am not sure if two node’s roles, one in possible legal cases and one as event organizer are so different. I am not the one who read covenants and ToS carefully, but as I got it node’s legal role is mediatory, i.e. that’s the first person to help citizens find solution that fits both sides. With that in mind social skills are more important than judicial. mediation is still very different from event planning: the skills are very different, even though both are social in the loosest of senses. In any event, mediation alone cannot provide for the rule of law: alternative dispute resolution of necessarily assumes that there is something for it to be an alternative to. How is a mediation-only system to cope where people, despite the mediator’s best efforts, fail or refuse to come to an agreement? In that case node send them to…. hmmm… director, I guess. Yes, those are two different social skills, but more than skills its more important that node is close with people of that sim and the sim itself. disclaimer: these are my oppinions and interpretations, not sure if the covenant was ment to be understood this way. @Ashcroft (8,10): I think we’re in an is/ought conflict here. Does SL need some real, effective institutions? Yes. Does the present system allow for them? I believe not. The TOS give absolute authority to LL, authority which they almost completely choose not to exercise. Even so, they have one power only: the termination of an account. This is both too much and too little a penalty for offenses: too much, in that it could represent a loss of thousands of $USD to an established resident, too little in that it does nothing to prevent a greifer from logging back on with a new free account. What happens when a party using our dispute resolution service fails to comply with a decision? What powers we hold are essentially feudal – LL’s power on the scale of the SIMs we own. And by “we,” I mean Galatea Gynoid, the person financially liable to LL for all Extropian territory. If the person is a Citizen of Extropia, “we” can refund their deposit (less a “pest control” surcharge, I’d hope!) and ban them from Extropian SIMs. There are no police powers, no jails, no judicial liens for fines. We simply have the powers of tribal communities from time immemorial: shaming and banning. – to the best of my knowledge, at least. If there are other tools, if anyone has experience with effective problem-solving methods we’ve overlooked, we’re very eager to hear about them, and to learn from you! there is no point in having any institutions of government at all unless they are capable of working. It does not make any sense to say, “the environment does not allow us to have effective governments, therefore we will have a government anyway, but not have proper judicial institutions“. Either there is no point in having any kind of government at all, or there is a point, and there is every reason to do it properly in every respect. I take the point that you made earlier about truly tiny communities (small enough for everybody to know everybody else, or, at the very least, virtually everybody else personally) not needing formal institutions, but, once one passes that minimum size, to the extent to which it is worthwhile having a governance system of any kind at all, it is worth having one including a proper judicial system and the rule of law to full effect. In fact, the situation is not as bleak as you imagine it as regards enforcement. At the Metaverse Republic, to which I referred you earlier, we are working on a system whereby anyone who disobeys a court order can be banned automatically from a very large number of subscribing sims (those who subscribe, in return, get the right to vote in elections to our parliament which will be able to pass laws binding on our courts, thus incentivising mass subscription). That will hopefully provide the intermediate layer that you correctly identify is needed. Sophrosyne, can I ask you if the inspiration for the hexagons-on-the-sea layout was inspired by Oceania — The Atlantis Project, also a libertarian community, that never managed to raise enough funds to be built in real life, but still got some buzz back in 1993/4? Let me correct my silly comment above. I had not read their site. Indeed, it’s inspired by Oceania. Well well. Isn’t this world small? @Gwynyth – say hi sometime! I’ve been hoping Extro DaSilva would introduce us one of these days! This Saturday, 12/22, we’re throwing a 12 hour Solstice Party, 9am-9pm SLT- all welcome! This is a really interesting development. I had heard of the Metaverse Republic and Al Andalus as these were started by people who had been/still are involved in the Confederation of Democratic Simulators but this one came out of the blue! I look forward to learning more about you and your system of government – the Oceania theme is very appealing. Sophrosyne – I plan to visit your sims in the next day or so, please come and see us in Neufreistadt, Colonia Nova and Alpine Meadow if you haven’t visited before. @ Patroklus: I’m looking forward to meeting you! I’m usually around 8-10am SLT and 4-8pm SLT, but I’ve got the flexibility to meet you pretty much anytime. Please feel free to IM me to set up a time to meet, if you’d like. Likewise, I’ve never been to any of the Democratic Simulators, and would love to visit. We’d be delighted to undertake the logistics to host a meeting of community organizers, or to support anyone else who’d like to do so!